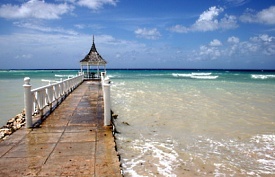 Jamaica is a colorful land with its white beaches, sapphire waters and emerald forests. The climate is warm year-round with little seasonal variation in temperature. Passengers docking at Montego Bay might browse the shops, tour Rosehall (said to be haunted) or Greenwood Great Houses, swim at the famous Doctor's Cave Beach or take a rafting trip down the tropical Martha Brae River.